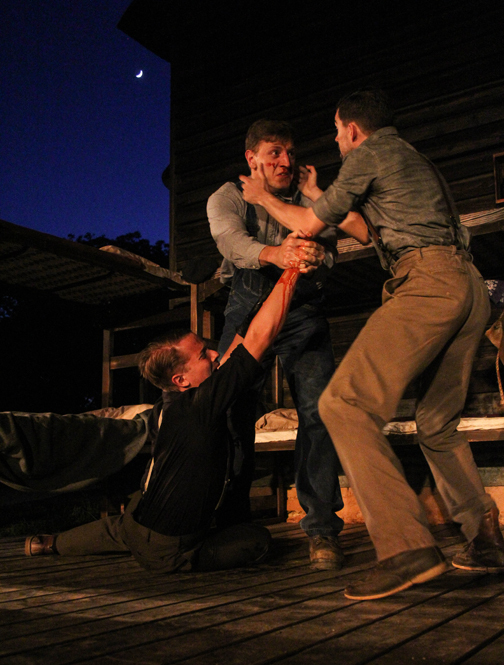 I'd never read or seen Of Mice and Men, but I have enjoyed the Serenbe Playhouse experience so I knew going in that it would at the very least be a remarkable evening. It was so much more. I was mesmerized from the beginning until the lights went down in the final scene, a tear slowly finding its way down my face. Nobel and Pulitzer Prize-winning John Steinbeck penned the novella in 1937. It's a tale of Great Depression hardship, unlikely friendship and an examination of loneliness. Serenbe Playhouse's adaptation, acted in the natural world—outdoors!, follows the friendship of George (Daniel Parvis) and Lennie (Blake Burgess) for a brief, but powerful time. You will enjoy some laughs with "the witty small guy and loafing giant"...and you'll be moved. The play begins off in the distance, in a field to the right of the stage. George and Lennie had been let off a bus quite a distance from the ranch where they were to find work. 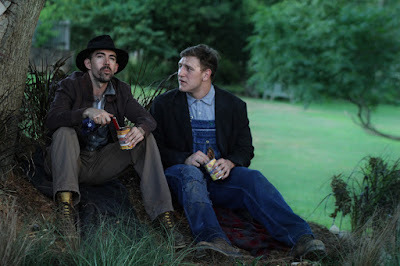 They spent the night under the stars, but not before Lennie insists on George regaling him once more with the story of how they're different from most guys, how their lives are going to prevail against all odds. 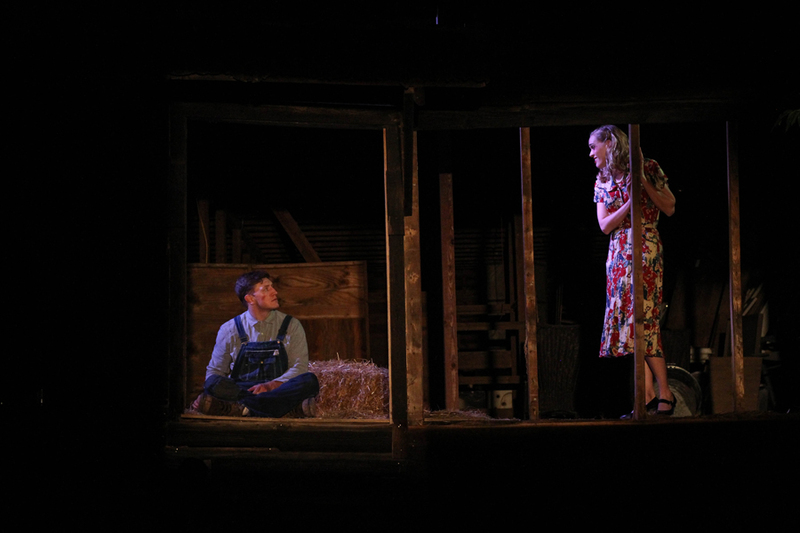 For this Serenbe Playhouse experience, theatre-goers remain in their seats (some shows are "roving"), but the set is brilliantly diverse, ranging from a meadow to creek-side, from the ranch bunkhouse to a barn loft. I had the experience of sitting in the middle of the front row...I was practically on set. It was awesome! There are two four-legged members of the ensemble, Hector and Autumn. 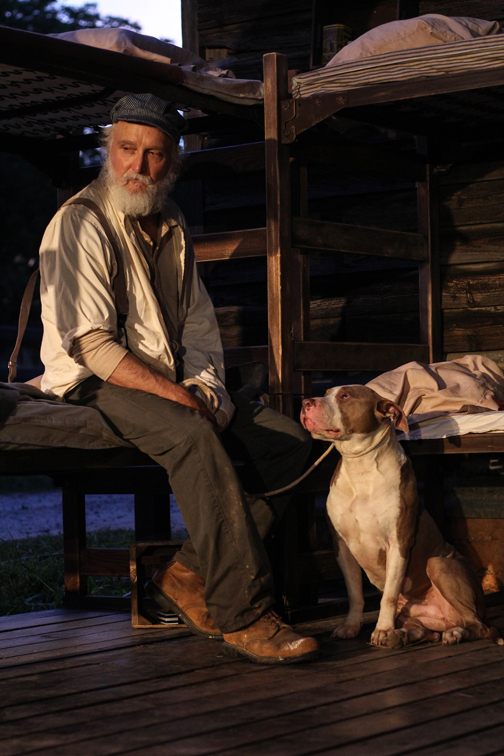 Serenbe Playhouse partnered with LifeLine Animal Project to work with the awesome "actors", who are both recent rescues. Michael Rudko, who portrays Candy (pictured above), is husband of the performance's director, Jenny Lord, alumnus of The Juilliard School. Both are Broadway vets and it shows. Rudko's performance, ranging from heart-broken to hopeful, is brilliant. Drama is the order of the day, or night as it may be. This show contains high-impact dialogue, energy and emotion. 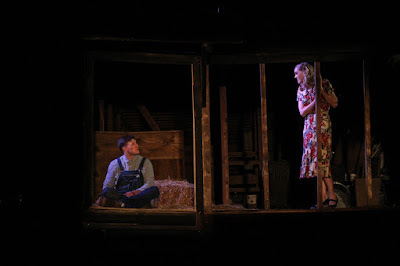 The natural outdoor setting—at the Hay Barn in Serenbe—and intimate-size audience makes you feel like more than a spectator...I felt like I was there on the ranch, feeling what the characters were feeling. One of my favorite aspects of a Serenbe Playhouse experience is that you're mingling with the cast, in costume, well before the play even begins. My friend Luc and I played horseshoes with Carlson (Jonathan Horne), while leisurely enjoying a libation, before the show! He's super nice, which I don't think was an act, then we were witness to his brilliant acting. Carlson is not nice at all...he has an evil streak, played quite convincingly by Horne, who had been so pleasant not long before. The entire cast is stellar, truly! We also got to meet Hector and Autumn after the show! My schedule did not allow me to see this show at the beginning of the run (I'd have seen it more than once! ), so if you're just learning about it in this reading, get your tickets now! 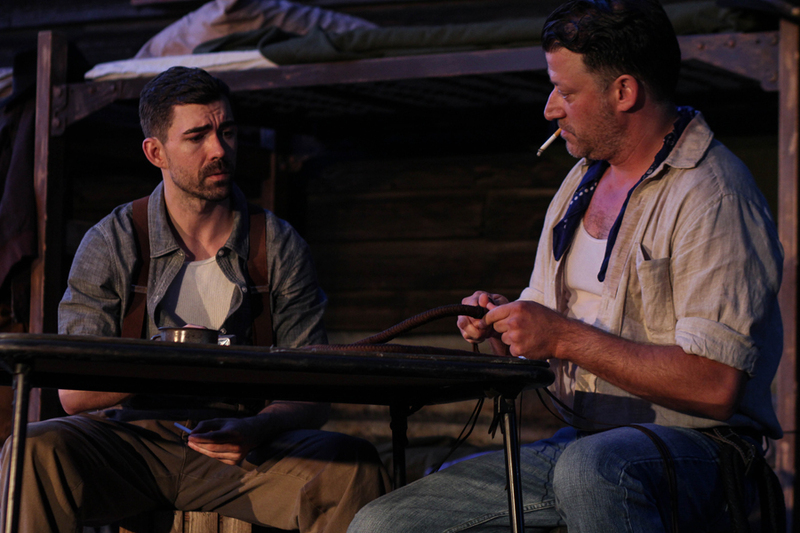 Of Mice and Men finishes with its Sunday, June 26 performance. For dinner, make reservations at The Farmhouse. I didn't go this time, but I have been before...it's lovely and delicious! Want to make a weekend of it? Book a room or cottage at The Inn at Serenbe. Both are sponsors of the show. A huge wanderlust ATLANTA "Thank you!" to Serenbe Playhouse for the tickets to the show, and a reminder to my readers that my writing is always of my own opinions and observations. Next up at Serenbe Playhouse...Miss Saigon! Tickets are available now. Focus on 5 from "Atlanta in 50 Objects"